Mix preserves, vinegar, mustard and ginger in 2-cup glass measuring cup. Place ham in 6-quart slow cooker, trimming ham if necessary to fit. Brush ham with about 1/4 cup of the preserves mixture. Refrigerate remaining preserves mixture while ham cooks. Cover and cook ham on Low heat setting 7 to 8 hours. About 20 minutes before ham is done, microwave remaining preserves mixture uncovered on High 4 minutes. Stir in currants and lemon peel; microwave uncovered on High about 3 minutes or until mixture just begins to boil. Stir in chives. Cool about 10 minutes. Remove ham from cooker. Slice ham; place on serving platter. Serve sauce with ham. Not sure what size ham to buy? 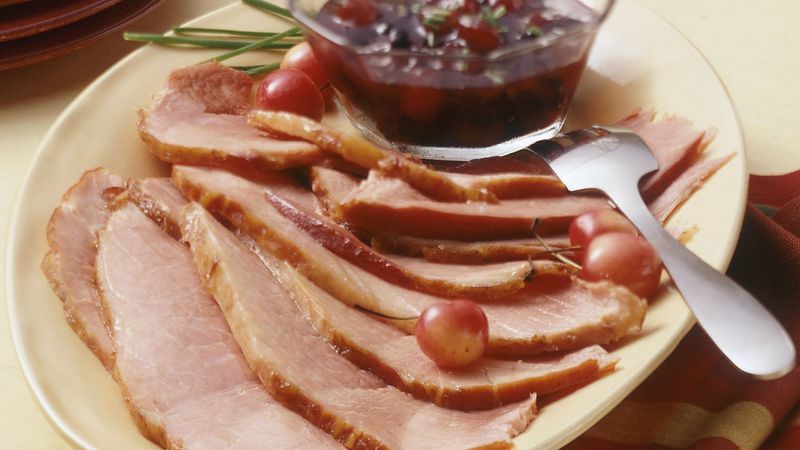 Keep in mind that 1 pound of bone-in ham is enough for 2 servings. A wide variety of dried fruits are now available at the supermarket. You could use dried blueberries, cherries or cranberries in place of the currants.